Although feeling cold is a common and well-documented part of Raynaud's disease, suffering from dry, cracked and irritated skin is a side effect that isn't often spoken about. 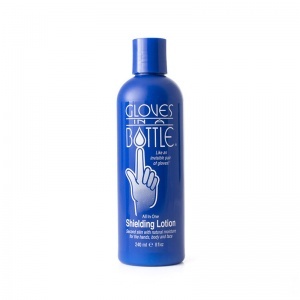 Gloves in a Bottle 240ml is designed to reduce the impact of the condition on your hands. By harnessing the natural oils and moisture found in your skin to improve the state of deeper skin layers, this product makes your skin feel supple and soft in the long run. This 240ml version of Gloves in a Bottle is excellent for helping you remain protected in a particular place, such as at home or at work where you need hand protection the most. If you're looking for a portable version of this bottle for times when you need protection on the go, the Gloves in a Bottle 60ml version is the perfect item for you. Small enough to fit inside most bags, the bottle is ideal for day trips, home visits and trips abroad. We also have a number of bulk packs available where you can benefit from the product for longer while also saving money. Click the links below to find out about each pack! What Is Gloves in a Bottle? Gloves in a Bottle creates an "invisible shield" on your skin that helps it retain its natural moisture and oil. This protects the deeper layers of the skin, effectively allowing it to heal itself. Not only does this product protect against chemicals and other irritants, but it also improves skin conditions like psoriasis, dermatitis, scleroderma and eczema. Take a look at the difference Gloves in a Bottle can make in just one month below or read the full Case Study here! Please note that it is advised Gloves in a Bottle is not used on open wounds; please wait for your wounds to heal prior to application. Please note that this bottle may be supplied with a pump action top.